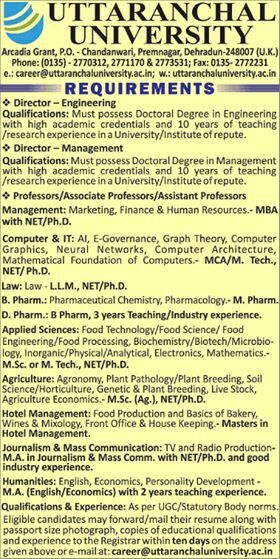 Uttaranchal University, Dehradun has advertised in THE TIMES OF INDIA newspaper for the recruitment of Professor/Associate Professor/Assistant Professor job vacancies. Interested and eligible job aspirants are requested to apply with in 10 days. Check out further more details below. College Profile: Uttaranchal university can boast of being an institution par excellence. It is located in a fascinating geological setting. It is flanked by NH-72 on one side and a beautiful broad slithering river on the other side. The pine trees surrounding the area lend a pristine and wholesome ambience to the campus.